Today I am sharing with you another breakfast dish The Stocked Freezer made during our October session. 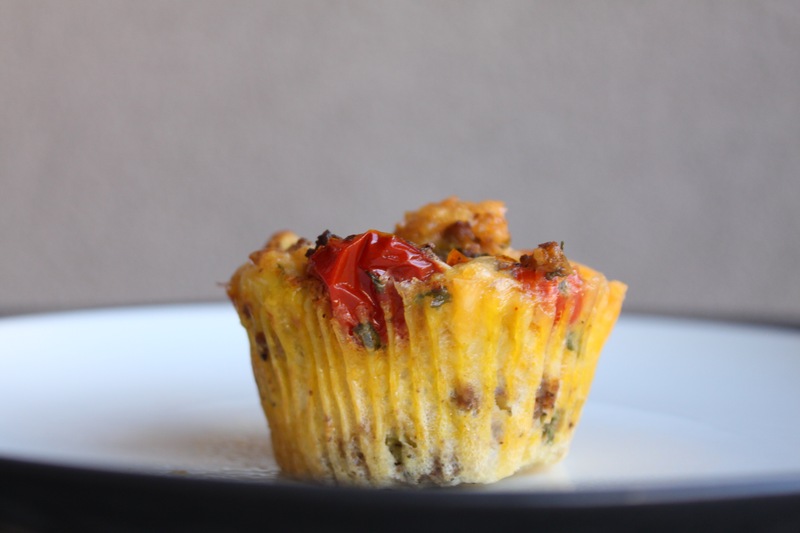 This mini-quiche is not for the light eater, although small in size, it’s quite hearty and will fill you up in a jiffy! The meat is flavorful and juicy, the potatoes crispy on the outside with a tender middle, the tomatoes add a hint of sweetness to the dish, I think you’ll find this quiche satisfying. Great for an on-the-go individual or an entire family, you can make these ahead of time and freeze them for a quick breakfast fix. Prep: Line muffin pan with baking cups and set aside.You will need two large skillets to brown both the meat and potatoes in. On medium-high heat, saute chopped onion until translucent, then add ground beef and brown. Drain beef and add paprika, salt and pepper to taste and set aside. In the other skillet, saute diced potatoes in olive oil and butter until golden brown. Add salt and pepper, parsley, tomatoes, garlic and green chile if you desire. While you continue to saute, whisk together eggs, milk and cheese and set aside. Combine meat and potato mixtures in a bowl and fill each baking cup three-quarters full. Pour about one-third cup mixture egg over the top of the meat mixture and bake at 350 degrees F for 20 minutes or until eggs are slightly firm and golden on top. notes: You Freeze quiche for up to three months. When ready to reheat you can pop them in the microwave for thirty seconds or up to one minute. You can also cover with foil and bake at 350 degrees F for 20 minutes or until center is warmed. did you know: You need at least half your body weight in ounces of water everyday to replenish your body fluids and stay hydrated! Hint, this is one of the top ten things necessary for your daily diet. Find out more about it in my upcoming, Ask the Dietitian, feature. … join me next week when I post my ‘Ask the Dietitian’ feature and learn the top ten foods necessary to your diet.